This is the summary of consumer reviews for Epson EX3220 and EX3212 3LCD SVGA Portable Projector. The BoolPool rating for this product is Excellent, with 4.50 stars, and the price range is $399.99-$469.95. The Epson EX3220 3LCD SVGA Portable Projector is a high-performance projector with fast and simple setup. With convenient HDMI connectivity, the EX3220 projector delivers digital video and audio with just one cable. A host of innovative features enables flexible positioning, easy navigation and rapid setup in any venue. Epson EX3220 has brilliant image quality with high color brightness. Delivering 3000 lumens of color brightness and 3000 lumens of white brightness, the EX3220 uses 3LCD, 3-chip technology for brilliant images with true-to-life color. The Epson EX3220 is compact and lightweight projector which makes it easy to carry. It also comes with a carrying case and remote. This projector has a USB connection to project images from a PC or Mac very easily. Some users had to use Epson's customer service and they were happy with the service and response they got. However, many user reviews complain that the internal speaker sound is low and you may need to buy external speakers to use with this projector. This is a SVGA projector so the native resolution is 800x600 which can be low for certain usage. Overall, the Epson EX3220 3LCD SVGA Portable Projector is the perfect solution for professionals whose presentations demand proven performance. It comes at an unbelievable price given its image quality and ease of use. Set up was very simple and my computer recognized the device instantly. Love that there's a USB adapter for hooking it to the computer. The connection and start up was without any issues. I received a live person within seconds of the call (very rare and thankful in today's computer generated maze of support) and he solved both my issues while staying with me on the phone until I implemented the correction to insure success. UPDATE: For Mac users who've Mountain Lion, the extension that Epson provides in the projector and that gets installed on your computer the first time you hook it up via USB isn't compatible with Mountain Lion. I found it very easy to setup on both PC and Macintosh computers. It's simple to use and has many nice features. Easy to use the first time setting it up in the office. We've it ceiling mounted and it responds beautifully to the computer and the remote. Took care of the issue in a timely manner with not hassles. The auido isn't good though, and it's no connection for external speakers. The only draw back I can see is the speakers aren't very loud, and external speakers will be needed. The only problem I've had is that I need more volume for the videos, I'm looking for external speakers that'll conect to it. Sure that I was doing it wrong, I went the FAQ section of Epson's website andfound this jewel: Q. Can I hook up external speakers. Our speakers show up with their presentation on a USB and we're ready to roll. l read the reviews and knew I wouldn't be happy with the built in speaker. We run educational events every month and we love this projector. Now I'll be purchasing a receiver/ amp just to hook up external sound. I love this projector, it makes using powerpoint presentations and videos a snap for my classroom. Picture was bright, even in a room with lots of natural lighting. This projector was a very easy setup,but the very low resolution was nearly unreadable when projecting a laptop HDMI of a Power Point. Good, bright, clear picture from all sources. I run A/V for monthly meetings and conferences in rooms with 100+ attendees, the Epson EX3212 does the job perfectly, and I can carry it like a laptop!. I'll probably get a $20 laptop case to put this in to keep it safe. I shouldn't have expected too much considering it's a native resolution of 800x600. Easy to use, comes with lots of plugs and cables. I set it up with various computers using HDMI and VGA and even used an old computer that was able to set to the low resolution and in each case I'd the same problem. It's light, looks great, works perfectly. Works good for a medium sized dark room home theater. The color is nice, it works perfect with the light. The video beam purchased is of excellent quality, perfect for my work, good size and perfect shine. LIghtweight, very strong, clear light, adjustable tilt on lens as well as adjustable feet and plastic prop. This unit however couldn't display vivid colors under normal flourescent lighting situations (like most offices) unless they were turned off and ambient lighting was utilized. There's an option of using the normal mode (worked fine for my Dell Studio laptop) or 4:3 or 16:9. 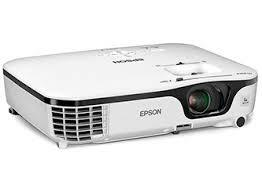 The Epson EX3210 projector is almost an entry-level projector that works well for traveling or casual presentations. Projected on a screen from 10 feet away movies are clear, sharp and very little pixilation is visible. I've tested this unit with Macbook Pros and Windows OS and it works fine with either system. Easy to use, easy to store, easy to carry. Unbelievably easy setup and operation. Works great, bright display, easy to connect and use. The projector is very easy to use and easy to transport. Back to the Projector, easy to use, easy to watch. Good picture , easy to use except for remote. It's light, easy to use, works well and is a good value. It's easy to set up, easy to navigate, and is fairly lightweight. Comes with case for easy carrying.